Let the games begin….and learn those lessons well. I’m very happy to say that my blog is getting lots of new traffic recently, so thank you to you, whoever you are, for reading it. The course that I did in Arolla was great in so many ways, but one of them was that I got time to collect all of my thoughts, collate my pictures, and pull everything together before I got back. It helped massively that I took my iPad with me to put it all down on – I have had my iPad for about a year, and most of the times sits there as a big underused toy. It does however come into its own at certain things and that was certainly one of them. 1. Listen to what people who know more than you tell you. Sounds bleedin’ obvious, doesn’t it? Well it should be, but I don’t always listen you see. Take as a case in point my camera. I own a very good Panasonic TZ7 digital camera. 12 megapixels, 15 x zoom, idiotproof, takes great pictures. I bought it just last year for Kilimanjaro and it continues to serve me well. I wanted better though. With Everest Base Camp and Island Peak looming, I thought ‘What if I had one of those fancy DSLR cameras – that’ll get the money shot, won’t it?’. So I researched until I was blue in the face. Cut a long story short, I spent a month buying up every photography magazine youm have ever heard of, and some that most people haven’t. Joined a few photography forums too, asked around, that sort of thing. Went into Jessops about 18 times. In fact I went into three different branches of Jessops about 18 times each. Decided that the thing for me was a Canon 550D. Looks great, big long lens on it, takes great pictures apparently and that sort of thing. I bought it and took it back after two days. Why? Well a.) it was huge, like massive, and wouldn’t have even fitted in my suitcase let alone a rucksack, and b.) after I took a bunch of pictures with it, I compared them side by side with ones I took from my Panny point and shoot, and I couldn’t tell the difference. At the ‘bargain’ price of £600, I decided that I had to have this. 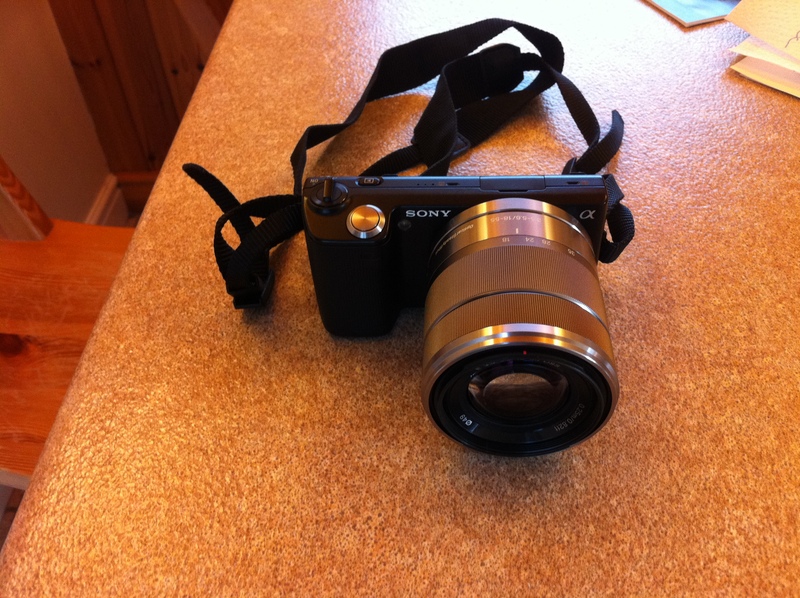 It is the smallest camera with interchangeable lenses, has a DSLR type sensor, and well, takes photographs and video. Excellent! Trouble is, when you are a.) hanging off a mountain, and b.) trying to minimise weight, you don’t need a camera with interchangeable lenses, and you certainly don’t need one that weighs about 4lbs and which takes up half your rucksack. What is even more galling, is that having got it back from Switzerland, whilst the pictures it takes are fine, and the ‘panorama’ mode is all well and lovely, I honestly wouldn’t be able to tell the difference between it and any other camera. I don’t after all even print photographs – I just download them and they sit there on my laptop like everyone else does. The ultimate telling factor was that I took more pictures with my iPhone than I did with the Sony – it was just too cumbersome to get out of the rucksack, especially when you are dealing with ice-axes, ropes and the like. So when I go to Everest Base Camp, I will take my trusty point and shoot, and happily pull it out whenever the mood takes me, and just enjoy the pictures afterwards. Lesson learned for sure. Anyone want to buy a camera? Sleeping in mountain huts is never easy. You hear every snore, moan, toss and turn of each person in there with you. Every sound is amplified too, as you are so far up in the mountains for there to be not even the slightest hint of any noise outside, and also you are cooked up together – in this case we are 9 people in a 8 x 10 foot bedroom. And so here we are, the four of us who barely know each other, sleeping with another five people whom we have never met. Everyone snores. I snore too I am told :), but when you are listening to other people snore, that thought doesn’t help you at all. And so begins my final day up in the mountains! I am also nervous. Looking out last evening at what faced us is a scary proposition. It is literally a case of fall and you will die. 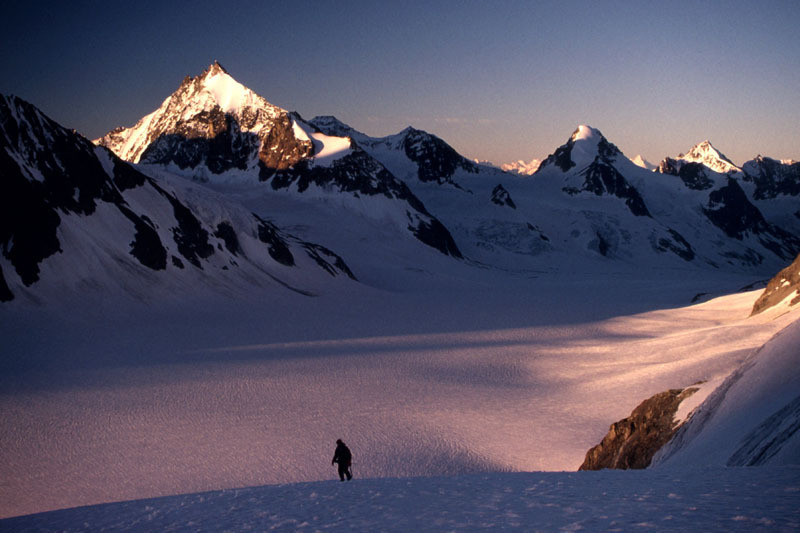 There is a 1,000m drop to the valley floor, and we must traverse across the top of it on ice. Being roped in helps hugely of course, but you don’t want to take three other people with you either. Worse still than being in fear of your own destiny is thinking that it may not even be in your own hands. If one of the others falls then that could take me down too. We have all heard the news this week on the Pic de Neige Cordier just over the border in France, where six climbers lost their lives in an apparent avalanche. They were all experienced, and just walking along roped up in two groups of three when tragedy struck. So when I wake at 1am this morning, my heart is racing. I am at over 10,000 feet in the Alps, and this is the day I am looking forward to more than any other, and also the one I am dreading. I do not know if my increased heart rate (it feels about 120 to me) is due to the altitude or trepidation or both. I resolve try to get back to sleep, although I am not sure that I properly did. And so 4am arrives. I feel shattered. Everyone in the dorm gets themselves ready and troops zombie-like to breakfast, which is the hut is 4.30am sharp. Just putting my contact lenses in at this time of day is hard enough, but with no mirror, and very dry air and eyes, I use up about three pairs before I am ready to see even slightly straight. By 5am everyone has crampons, helmets and full mountain gear on, and is roped up. It is -7 degrees C, and it is stunningly beautiful outside. 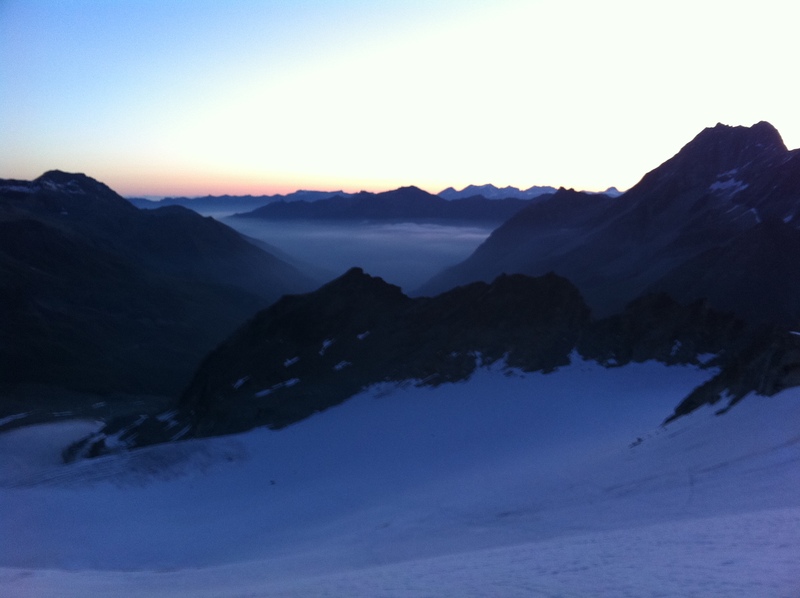 It is only just light, the sun yet to climb over the 4,000m+ peaks that crowd the Italian border to our east. I feel so tired that I am not ready to make a conscious decision that I want to do this or not, but decide that my desire to get to the top is the overarching thought. It is why I am here. The summit is everything, or thereabouts. The view as day breaks from the hut looking back down the valley - the cloud level below us at about 2,500m. After an initial traverse which is fairly scary, principally because there has been another serac fall in the night across our path, we set off for the ridge which will lead us up to the summit glacier. 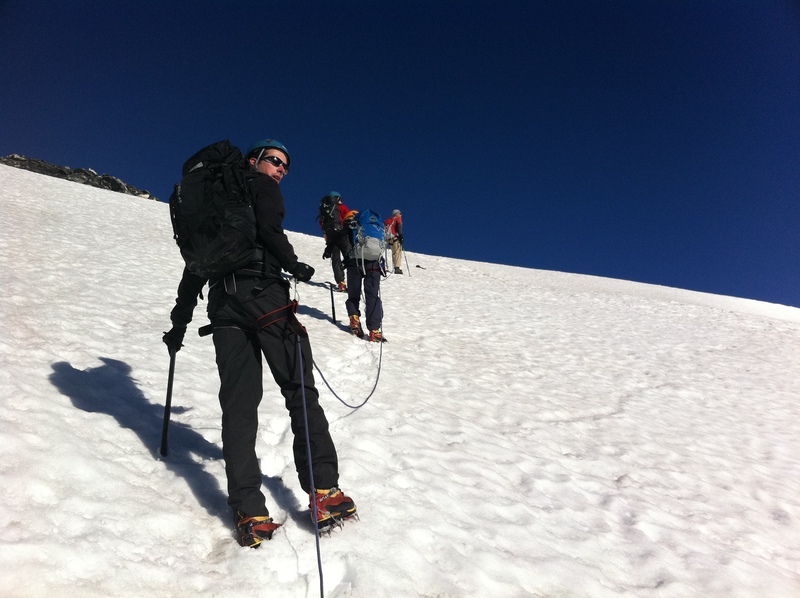 The snow on the glacier is perfect for crampons. It is very cold and so the crampons bite perfectly, the snow and ice having frozen overnight. There are about four other groups going for the summit alongside us, and everyone is a fairly similar pace, crawling up the glacier like some bizarrely slow ant chain. As the sun rises (or reaches us in any case) at about 6am we are making good progress, and for me I am just delighted that I am apparently not holding anyone up. The views meanwhile are utterly spectacular. 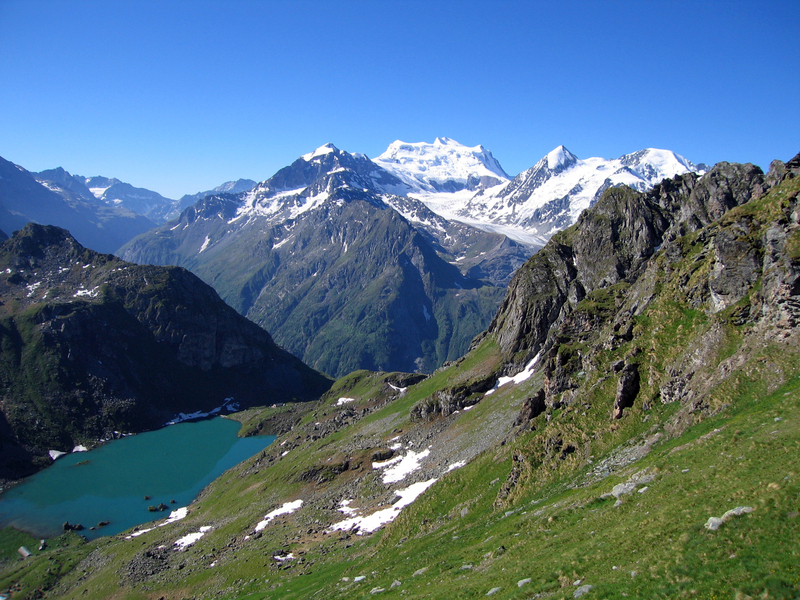 Before long the Matterhorn, Breithorn, Monte Rosa, and Dent Blanche come into view, and we have a panorama of snowy 4,000m peaks, shining like lighthouses in a sea of tranquility, as the cloud level in the distance sits below each of them, and indeed of us. I think there are something like a hundred 4,000m peaks in the Alps, and it almost feels this morning like you could reach out and touch all of them. 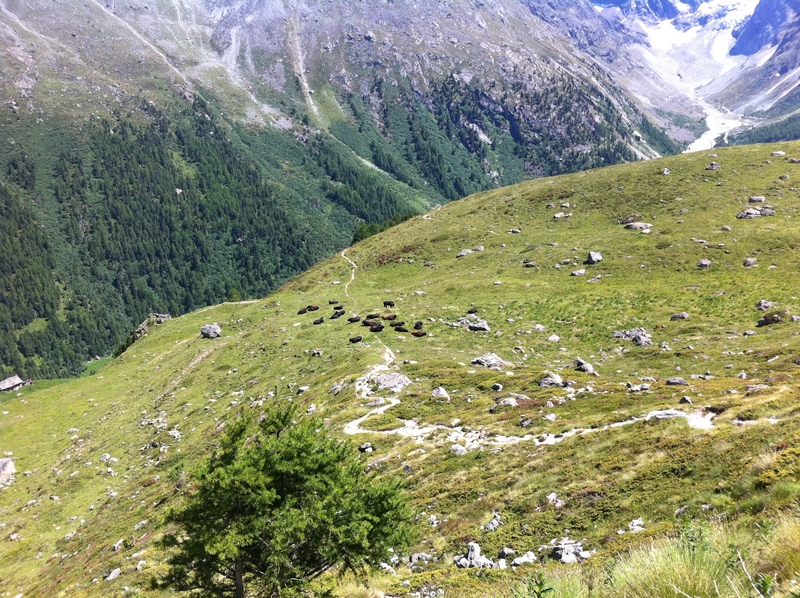 The trek up towards the summit of Pigne D'Arolla, looking back down as we take a breather. 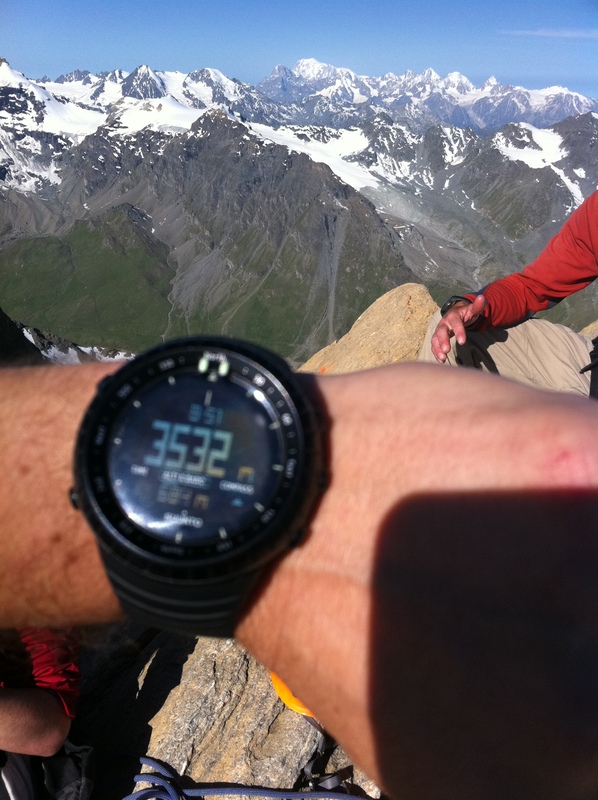 I check my altimeter – we have reached 3,600m, only 200 or so vertical metres to go. I feel for the first time that I am going to make it, although our own summit is not yet in view. I am drinking copious amounts of fluid in the fiercely cold and dry air. I carried four litres with me, and ended up drinking it all. The amazing thing is the air. It is so crisp and clear. This is what it is all about. I am for one moment completely overwhelmed by it all, and feel a surge of emotion come over me. I now know that wild horses will not stop me getting to the top of this thing – I will be carried on adrenaline alone. 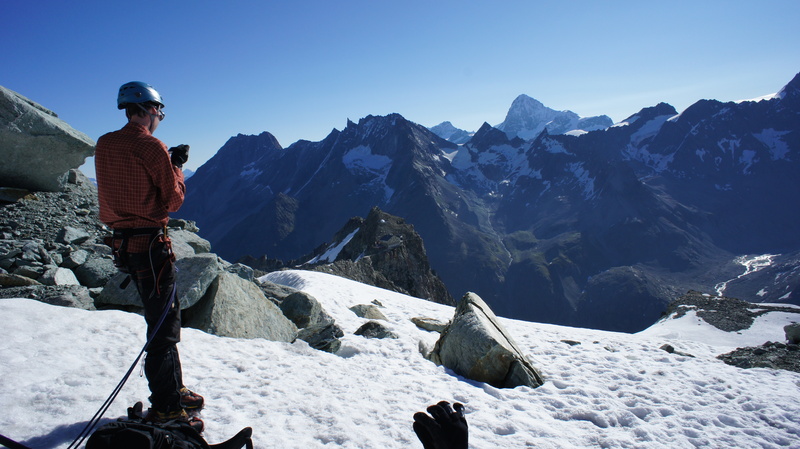 Summit panorama shot, Pigne D'Arolla - 1st July 2011. Breathtaking. In a moment of total emotion, I realise why I am here. The utter joy of a summit top is so many things, but it is the culmination and indeed conglomeration of so many emotions and tribulations which makes it such an event. The summit is always the climax, the achievement, a pinnacle in both physical and emotional senses. The Pigne D’Arolla does not disappoint at all. I have the (almost) same feeling of elation as I did when I reached the summit of Kilimanjaro, but without the altitude difficulties, so it is just wonderful. I feel actually invincible, for just that brief moment in time. I lift my ice axe above my head and punch the air in delight. The moment of unbridled happiness. Andy, Kelly, myself and Tim - a moment to celebrate. We did not linger on the summit much past taking a few photographs. It was too cold, and we need to get out of the wind. But what a fantastic (and that is an understatement) feeling it is. 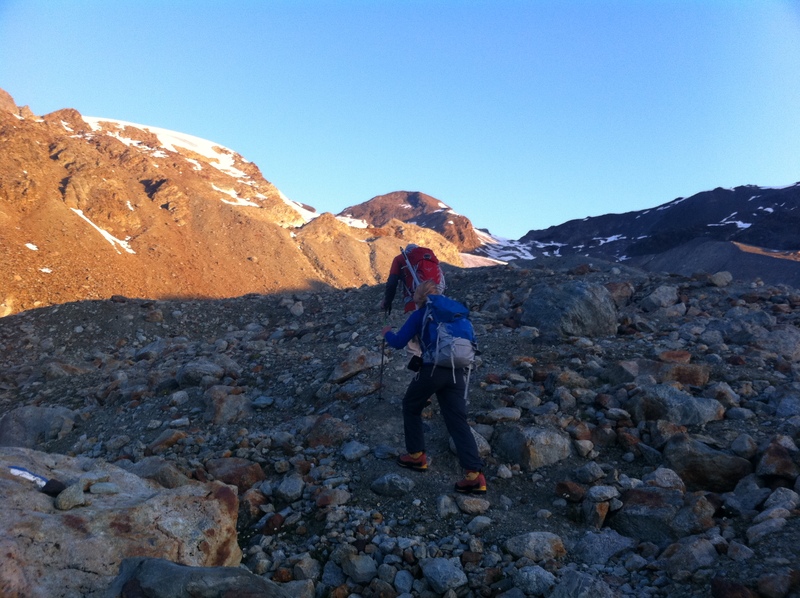 We thus head down and make our way back down the glacier, and it is still just 7.45am. 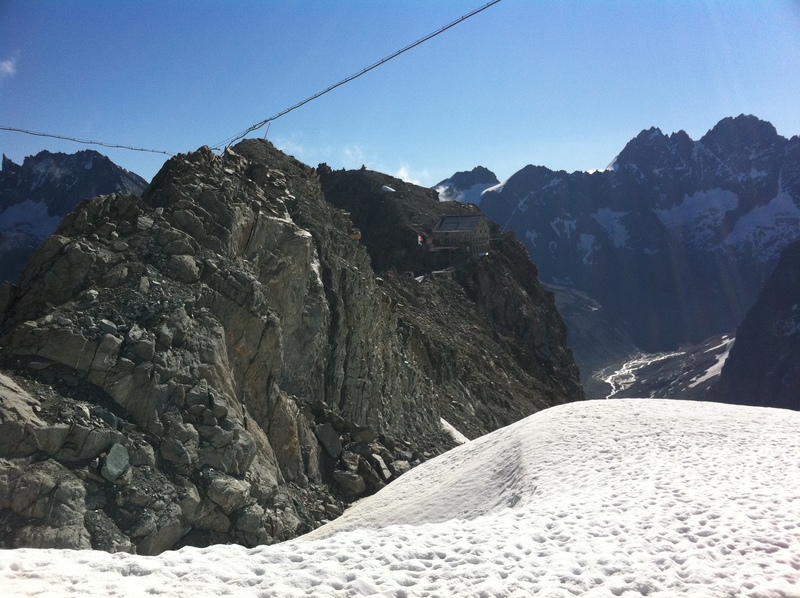 At around 9am we pass the Vignettes hut again, and the view of it from the other direction is even more staggering. I wonder how these things are built in the first place, and am grateful that I had not realised just how precariously perched we were when I was lying in bed last night. The Vignettes Hut, seemingly hanging from the side of the mountain (middle right of picture). Another shot of the Vignettes Hut on our way down. The rest of the descent down the mountain is fairly straightforward, if very tiring. Kelly in particular has ‘jelly legs’ but we are all feeling it. We ended up doing just under 800m of vertical ascent since this morning, all on crampons, and then 2km of vertical descent, about 1.2km on crampons. The views of the summit on the way down make it look improbable that we were even there in the first place. Looking back up to the Pigne D'Arolla from the glacier on the way down. 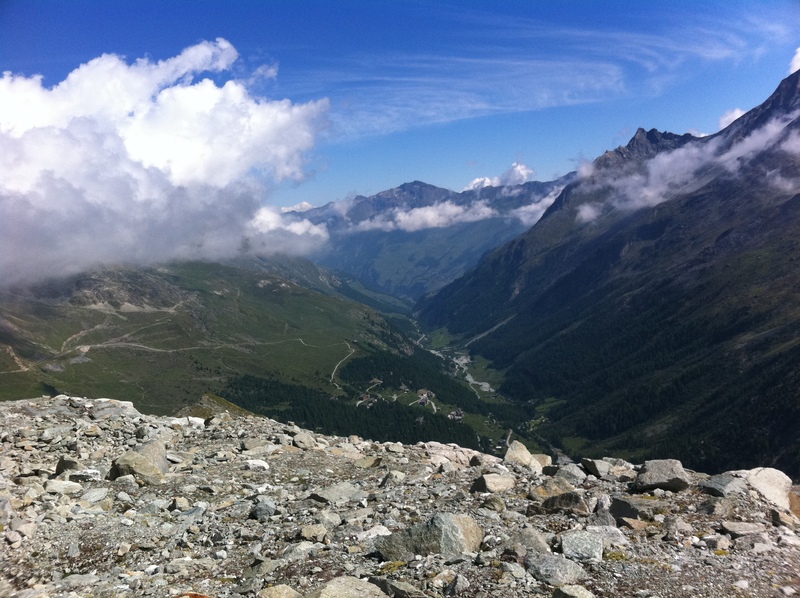 Arolla finally comes into view in the valley below. 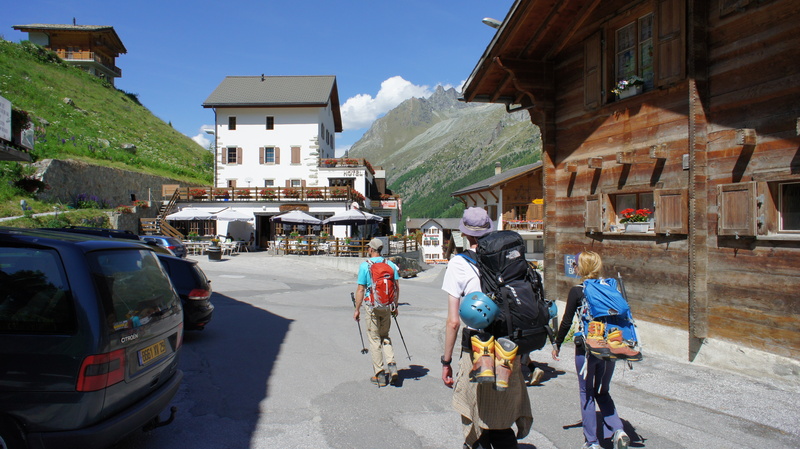 We reach Arolla at 12.20, and stop for a well earned beer, and then have lunch in the only restaurant in town. 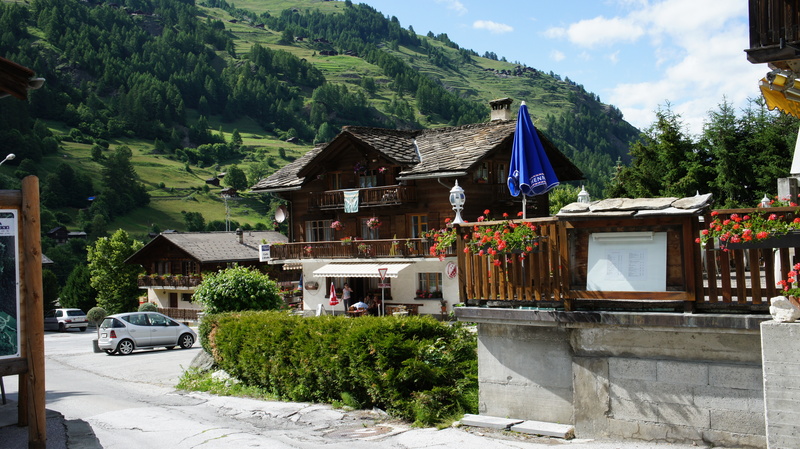 Arolla has two shops, a post office, and three hotels. It is lovely though. 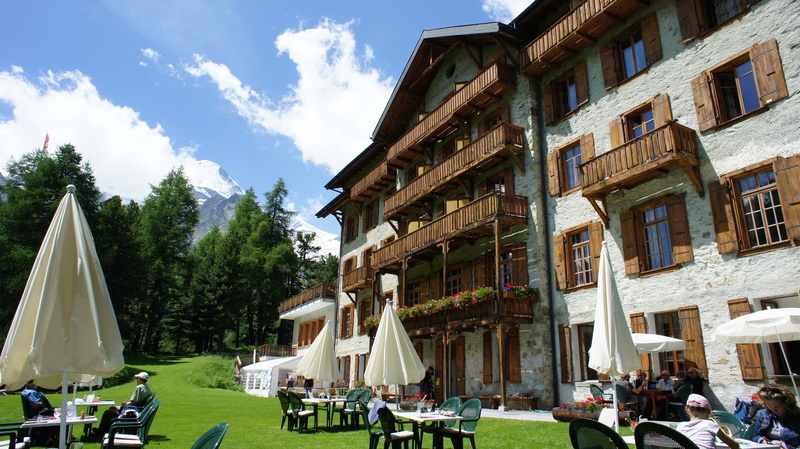 The garden of the Kurhaus Hotel in Arolla - the snowy summit of the Pigne D'Arolla in the distance. After a much needed bath and a few hours shut-eye, we join Andy for our last dinner in Arolla, and we have Raclette, which is great. We are also joined the four other guys from the other Jagged Globe trip whom we shared the dorm with last night in the hut. 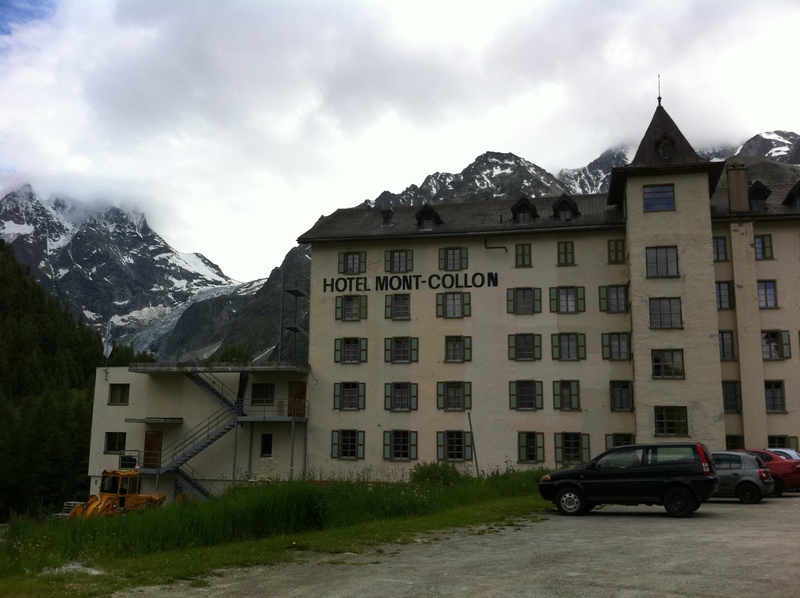 They are staying at the Mont Collon for the night, and The Shining jokes come out once more. It is really strange if only because this is the first time in the week that there has been anyone in the hotel at all apart from us. It’s a shame for the hotel really, about which I should say more in a subsequent post, but it has all been fine, and better than that really, despite my initial reservations and recoil. The hospitality, food, and service have all been really excellent. The family who run the place simply could not do enough for you in any regard. I shall miss the place, I really will. So tomorrow morning I will leave here by two bus, train, plane and finally car to get home. I will be sad to leave. The week has been everything I hoped it would be, and a whole lot more. 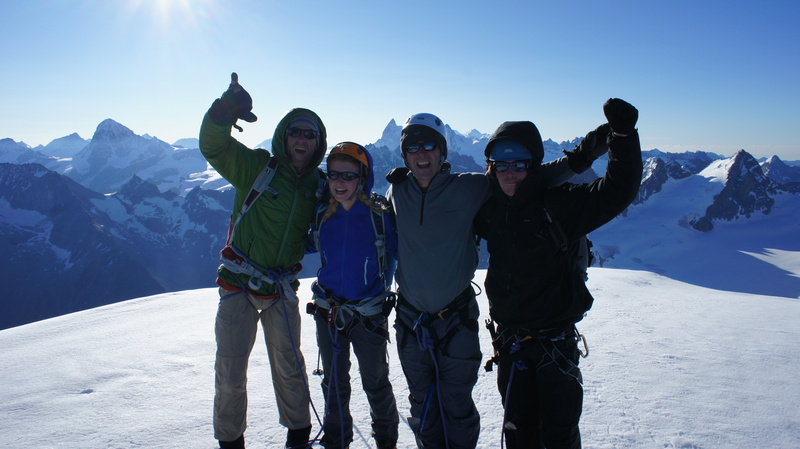 To anyone considering going on this course I would just say “go” – you will learn so much; about the mountains, about alpinism, about technical glacier travel, and ultimately about yourself. Perched up at more than 9,000 feet in the Swiss Alps, I was awoken in the Aiguilles Rouge Hut by our climbing instructor, Andy, around 4.45am. I slept badly, tossing and turning for most of the night, and so breakfast was not really going to go down well at that time. I knew I had to eat however, as we were about to burn a whole host of calories ascending the glacier. Following a hearty Swiss breakfast of muesli and cheese and the like, we set off at around 5.35am. 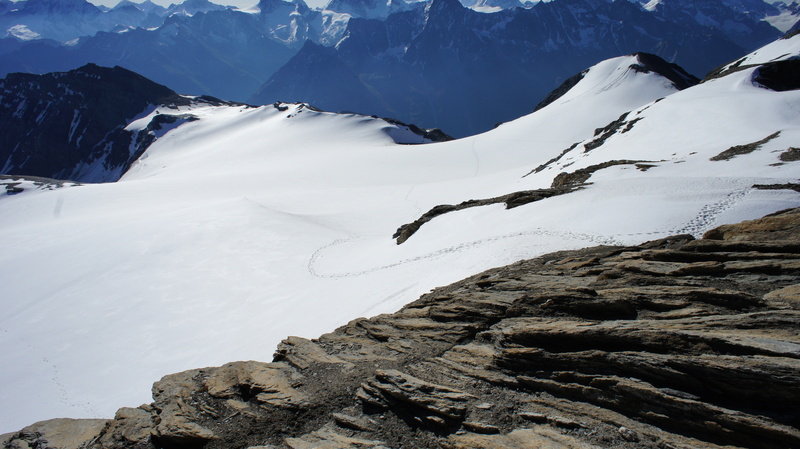 We would walk for about an hour up a steep and rocky ridge to around 3,100m before getting to ‘crampon point’, where we would no longer be able to travel up the glacier without ropes, ice-axes and crampons. The Pointe de Vouasson, its summit just under 3,500m, lay in wait for us. As we set off the sun was yet to hit us, blocked out by all manner of peaks that slowly came in to view. The views were nothing short of superb. 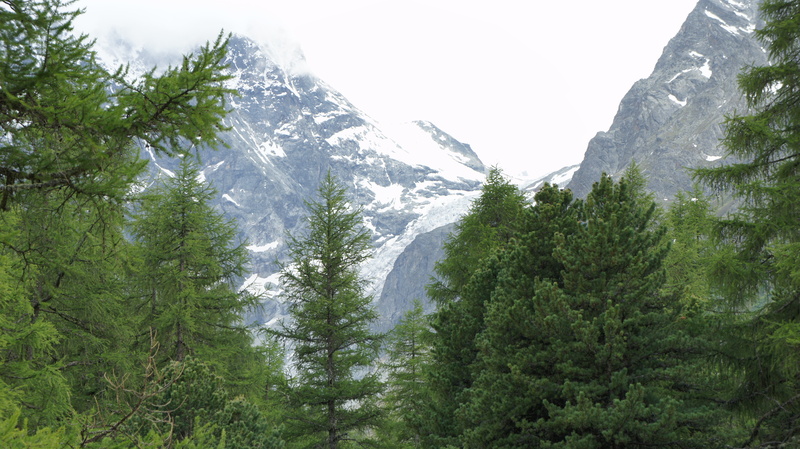 Before long we had a stunning view of the Matterhorn, all 4,478 majestic metres of her. 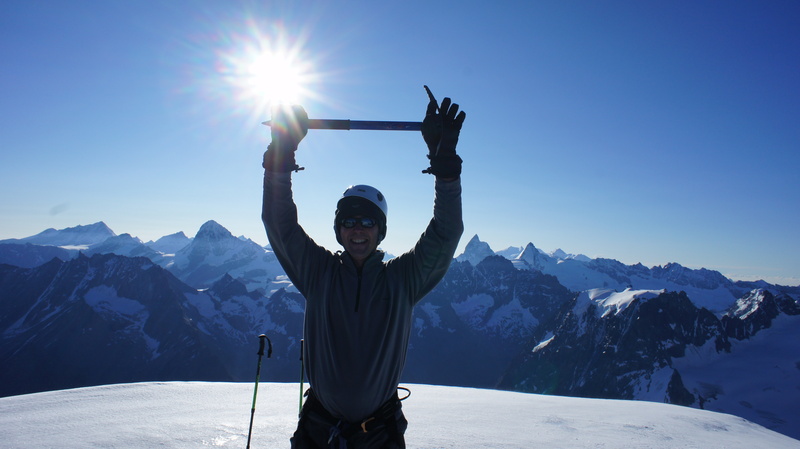 Then other peaks such was the Dent Blanche (4,356m) came into view, and many other 4,000m + beauties, that Andy would stop and point out to us, but whose names for now I cannot recall, but will do so and fill in here at later date. 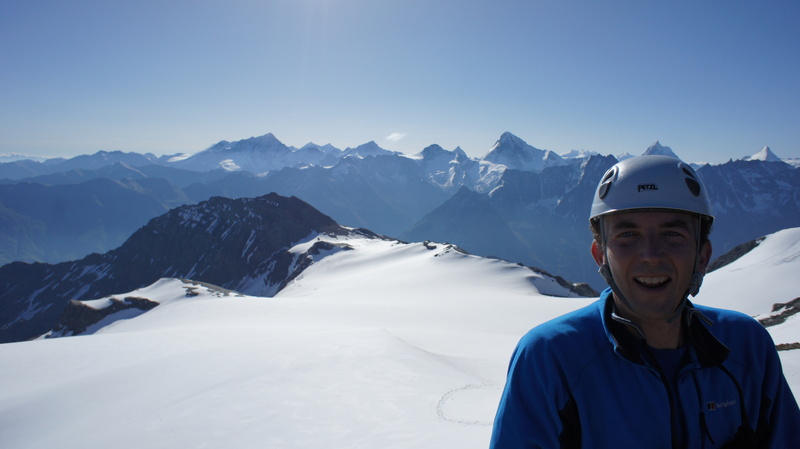 'Crampon Point', at about 7am - The Matterhorn in the far distance over my left shoulder. By the time the crampons and axes came out the sun was on us already, at about 7am. 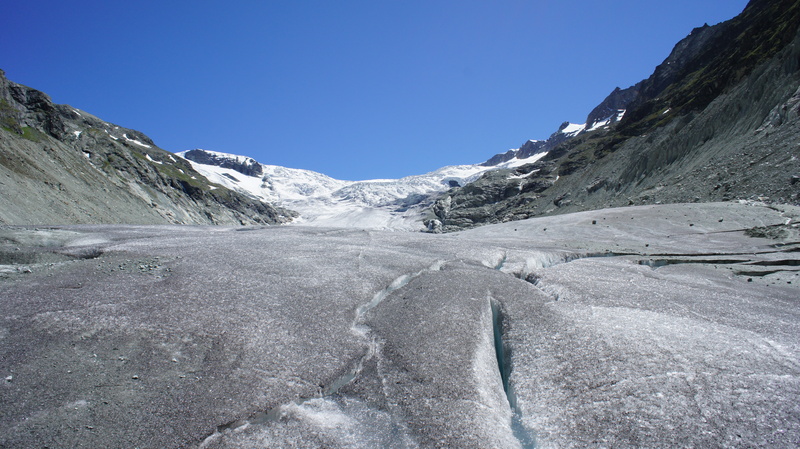 The snow on the glacier was really hard work though – the weather being so warm meant that the snow on top was wet and soft, and sometimes you would sink down to your knees and find it hard to get out. I struggled quite frankly, and found it exhausting. I am conceding 20 odd years in age to each of my fellow course members, and so I was undoubtedly the slowest of the group. With ‘normal’ trekking you can stop and take a rest, but when you are roped up on a glacier, you either have to keep going, or ask everyone to stop with you. I did so probably six times on the way to the summit, and it made me feel bad and frustrated, and sorry for them that they had to stop for me. Stopping for a breather climbing up the glacier. We reached the summit eventually just before 9am. The summit is a very small rocky outcrop at about 3,500m. It was my first Alpine summit. Andy shook out hands and congratulated us, which was really nice. The summit gave me a bit of vertigo as the drops were precipitous on all sides. But what views! My altimeter worked! This is the summit, Mont Blanc in the far distance. Andy told us that Point de Vouasson has one of the best views of all Alpine peaks, as much as anything because it is unobscured by other tall peaks around it. With clear and cloudless skies we had views all the way over the Bernese Oberland to The Eiger, stunning views of the Matterhorn and Monte Rosa to Italy, and then to our west, Western Europe’s highest peak, Mont Blanc, stood defiant, her saddled top betraying both the majesty and the difficulty of her steeply sensational beauty. One of the best things of all about this peak was that we weere literally the only people on the mountain that day – we did not see another soul going up or coming down, and that is priceless. We could also only see mountains, and snow-capped ones at that, in every direction, as far as the eye could see. We stayed for around 20 minutes at the summit, dealt with a small injury of mine where I had stabbed my left leg near to the knee with my right crampon, courtesy of some very soft snow on the way up, and began our descent. I led this time, much more comfortable in this direction, though it was still hard going due to the soft snow. .....whilst the others secured the rope from above in the snow before hauling me to safety. The drop below me is about 100 feet to a frozen lake. I was literally clinging with all I had. The rescue took about 20 minutes or so, and I have never been so relieved in my life to be off the rope and standing up again. We then took turns at practicing with each of us falling over the edge and pulling the other ones up, apart from Kelly who refused to go over the edge. I don’t blame her. In fact I ‘had the chance’ to have another go, and I politely refused – once was enough for me. 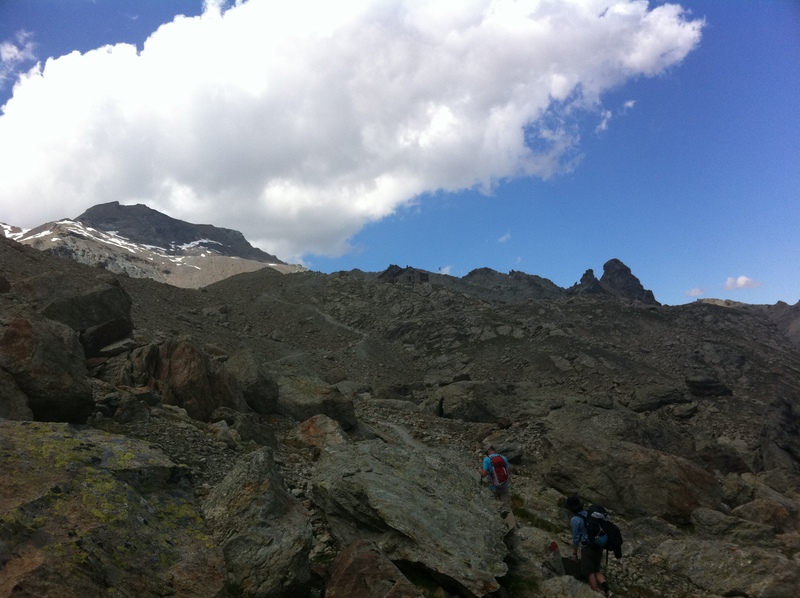 Following this we returned all the way to 2,850 metres and the sanctity of the hut. 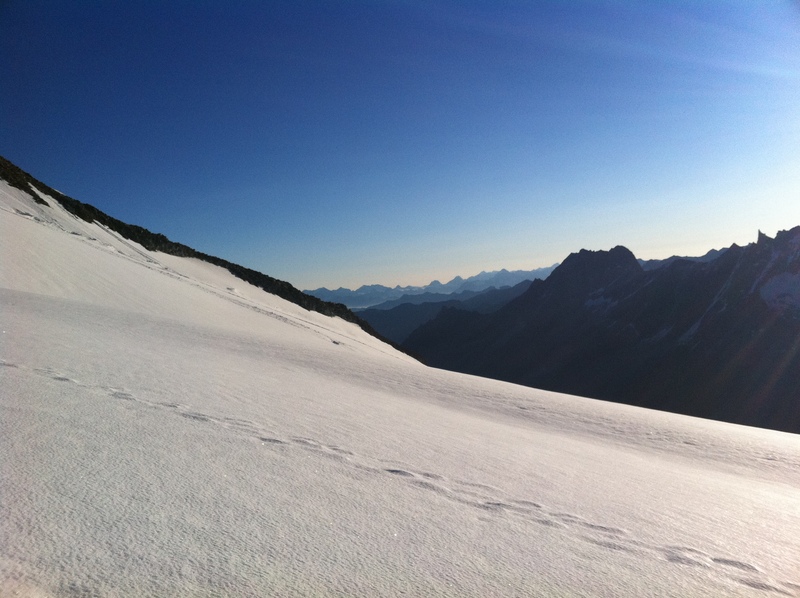 It was so nice to get the mountain boots and crampons off (we carried approach shoes with us and waked down in those). 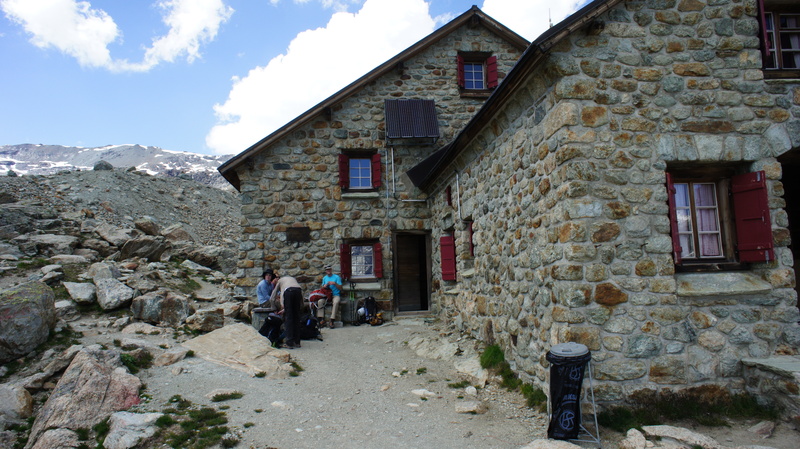 We lunched at the hut (if you ever go, take a wheelbarrow of cash with you – the service and food is great, but 8 quid for a bottle of water is a lot of money, although I do appreciate that they have to bring everything up in a helicopter). We set off back down the mountain at around 1.30 – it seemed already a long day from 4.45am. 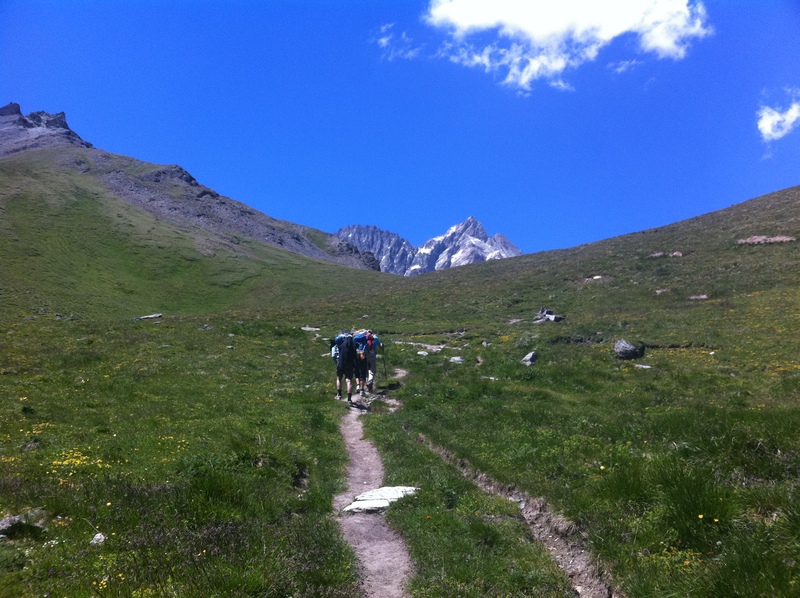 The descent from there back to Arolla was around 2 hours – by the time we got back it was really hot. We were all very glad to get clean (my shower felt fantastic) and just to chill for the evening. Back to Arolla itself, which is very pretty - it even has two shops! Tomorrow we will be climbing and abseiling in some tough place down the valley. This will be the day that I dread. Vertical rock faces upwards or downwards are almost too scary for me to think about. I’d rather be thrown into a crevasse…..
And so day two of the course proper began quite gently really, which in fact straight after breakfast manifested itself in the garden of the hotel, learning various rope skills with Andy our instructor. 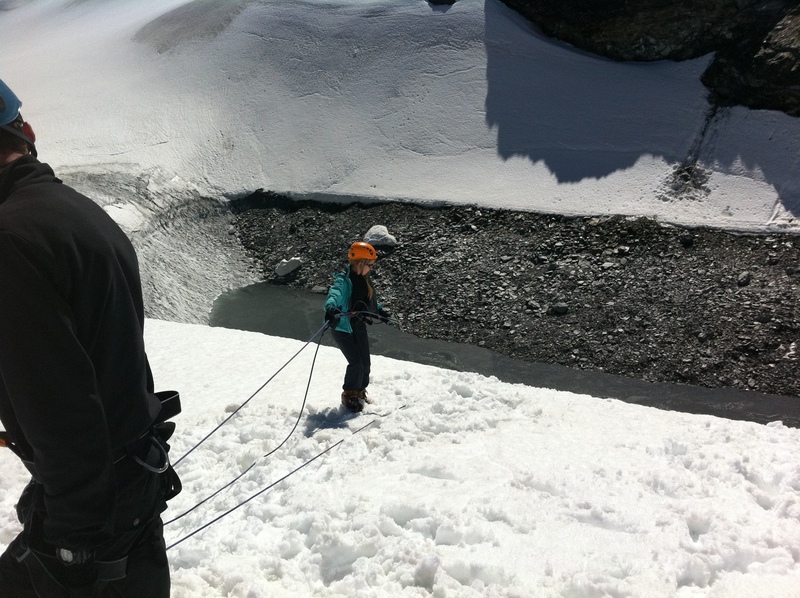 Armed with a host of carabiners, slings, ropes and various other strange looking devices, oh yes and also the stump of a tree, we practiced all sorts of things which we would later put into practice either on the glacier, or otherwise climbing somewhere. It was a bit safer to teach us in the garden, Andy reckoned, and this is an introductory course after all. The training was great. Andy is a great and very patient teacher, and he needs it with people like me! Before you can learn to do anything there are so many knots that you need, and so when asked to do a clove hitch I just look blankly and said ‘help’! I am glad to say that I can now do this, helped by a strange arm-crossing movement which at least means I can remember it. I can also do Italian hitches, double-threaded figure of eights (used when you are at the end, as opposed to the middle, of a rope), and various other useful ones. I hope to be able to remember them all under pressure. I also now know what a prussic rope is for! This great revelation will come in very handy in so many situations, but I can now tie a prussic knot (French and English varieties, if you please) and use one. I can also differentiate between different types of carabiners, know how the loading works, when to use each kind etc. Before I went on this course, I have to say that I could tie a reef knot, and that that was probably it, so the learning curve was certainly steep, but thankfully never insurmoutable. 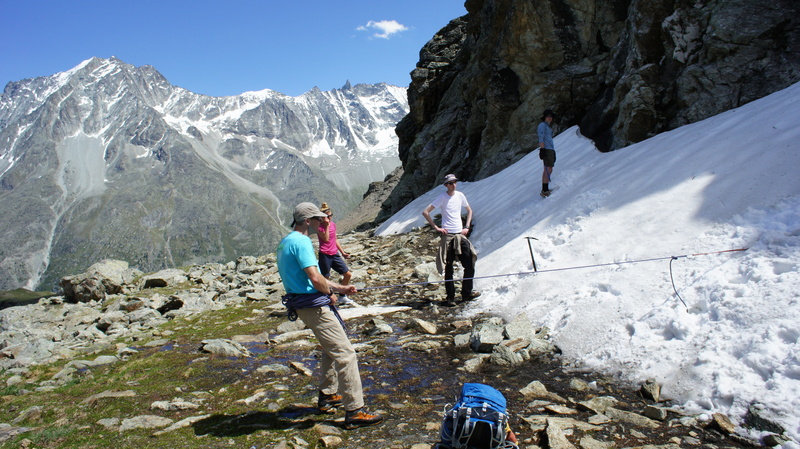 So armed with all sorts of new knowledge, we set out for our hut in the afternoon, armed with crampons, ice-axes, various ropes and harnesses etc, to climb our first Alpine peak. The walk was tough, made tougher by the very hot weather. The weather forecast I looked at last week showed temperatures in Arolla at around about the freezing mark. This week it has been around 25C here every day. 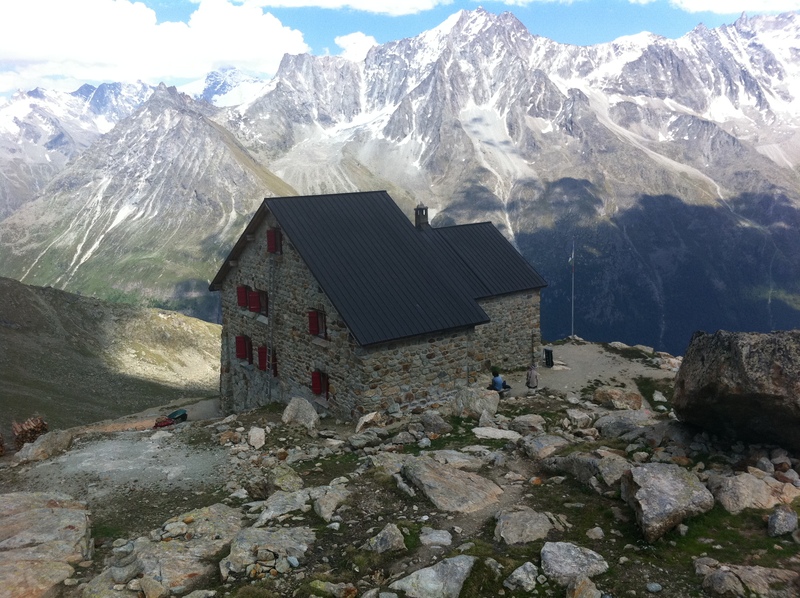 We climbed out of Arolla, at 2000m, up to our base for the evening, the Aiguilles Rouge hut. 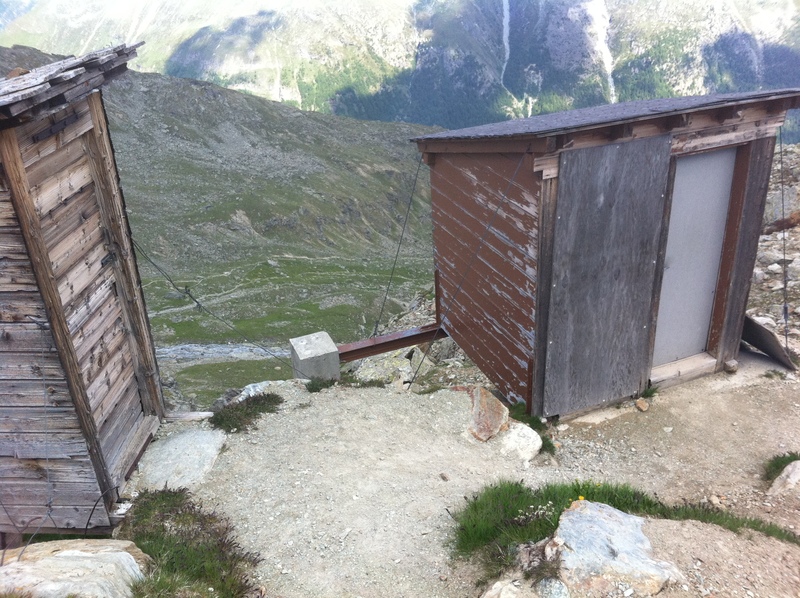 The hut is at 2,850m, and the walk took around 3 and a half hours. On our way up we stopped in a few snowy spots to learn how to make anchors using ice-axes, and we would get to put this into use in anger the following day. The hut was a typical Alpine hut, small dormitory bedrooms, a communal eating area, and no facilities to speak of, or not inside anyway. To clean your teeth or get water (although undrinkable) you had to walk down to a tap outside. To go to the toilet you had to walk about 25 vertical metres down a sharp hill to a ‘drop-off’ toilet – memories of Kilimanjaro came flooding back to me. ....and the 'drop-off' toilets - definitely a precarious place to perch. We were all in bed at around 9.30, as we would need to be ready to go at 5 the next morning. 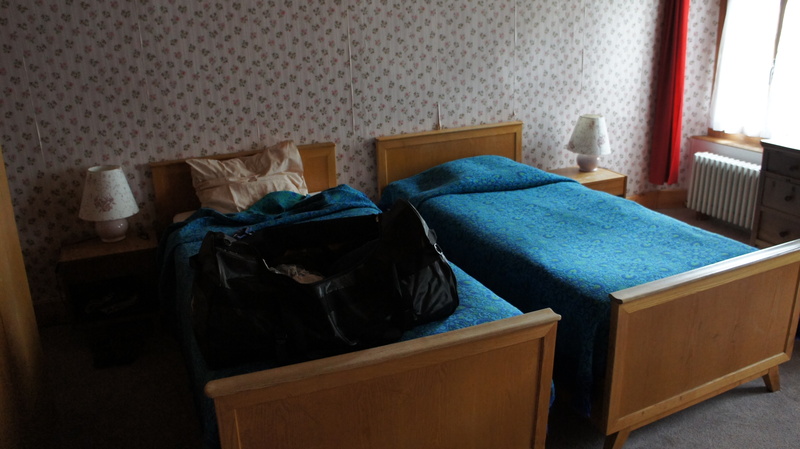 The dormitory was comfortable (we had a place for the four of us to ourselves) but sleep was very hard to come by for me – Kelly said she struggled badly too. Maybe it was the altitude, maybe the thought of getting up at 4am, maybe the trepidation/excitement of scaling your first ever Alpine peak. Pointe de Vouassan would be our destination in the morning. 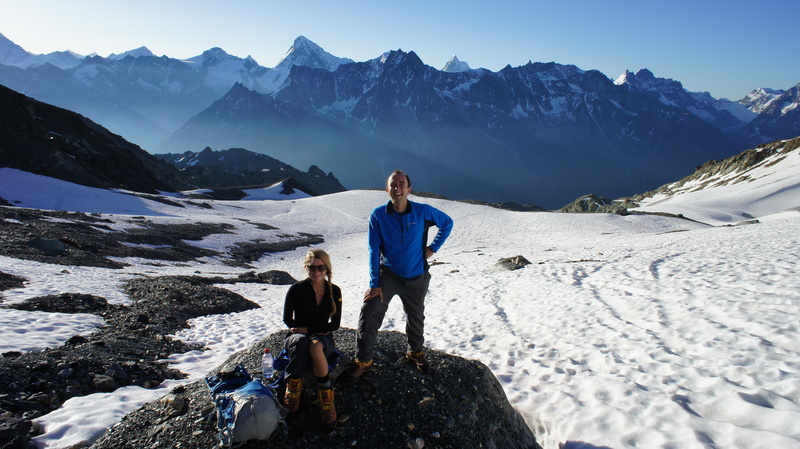 I was quite nervous – how would I fare at 3,500m on crampons? 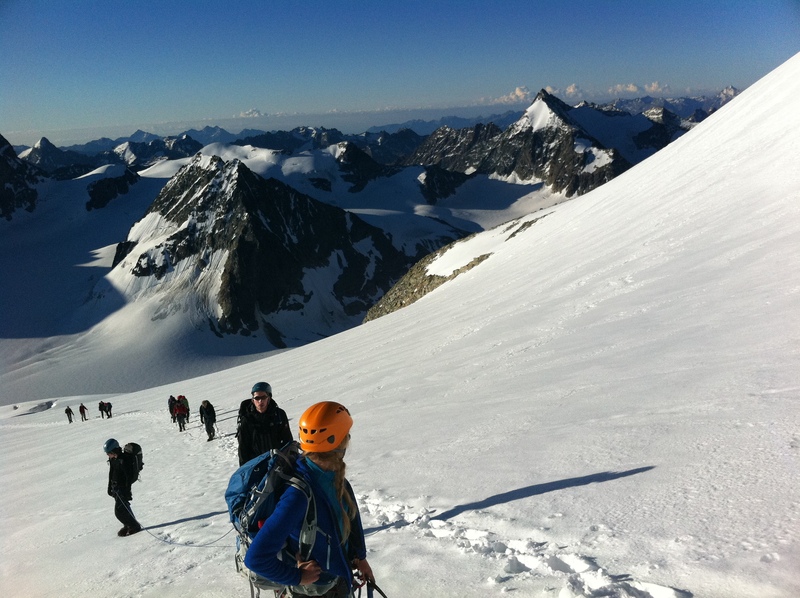 On the 25th June to 2nd July I went on an Alpine Introduction Course run by Jagged Globe. I did so as a precursor, and in fact a prerequisite, to my Island Peak expedition this coming October. I did the course as a single traveller. More information on the course, by way of link to Jagged Globe’s website, is contained in the link below. I should point out that I have no connection or affiliation to Jagged Globe whatsoever. Any and all comments are extremely welcome at any time. So day one is arrival/transfer day, and what a long one it is. 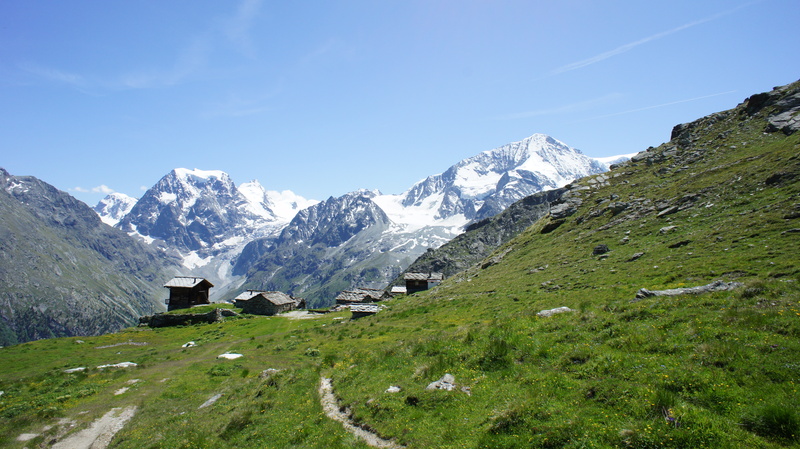 To get to Arolla from where I live involves a one hour drive to the airport, a flight to Switzerland (Geneva), a train journey to Sion, and then two bus journies, one to a place called Les Haudères, and then a bus from there to Arolla. It will take about 10 hours from leaving the house altogether. I think if was contemplating this trip in most countries other than Switzerland I would have been concerned about getting there, especially weighed down with about 70lbs of luggage (I’ve never been able to pack efficiently and this trip is no exception). As it is, although it is a pretty long day (up at 4.45am on a Saturday is not my way to start a ‘holiday’ believe me), I am not concerned. Switzerland is not Switzerland for nothing, and everything runs like, erm, clockwork, pun very much intended. Landing in Geneva at around 10am after a very uneventful flight from Heathrow, I purchase my train and bus ticket, and after reeling somewhat at the cost (£140 or thereabouts), I am at least on my way. The train journey is pure delight. I have various books to read, but they do not even make it out of my rucksack as I simply cannot take my eyes off the scenery. Every time I come to Switzerland I seem to forget (even if it just three months since I was last here) how stunningly beautiful it is. The train wends its way along the shores of Lac Leman, past Lausanne and Montreux, with views as beautiful as anywhere I have ever travelled. The sun glimmers off the lake like millions of stars, the northern Alps rising spikily and stunningly over at the other shore. I could ride that train every day of my life and never tire. The train takes me after about two hours to a place called Sion (where I cannot get the tune from Boney M’s Rivers of Babylon out of my head :)), from where I must make the rest of my journey by bus up into the Alps. I then had two hours to kill in Sion before catching the bus (I chose to catch an earlier flight just to make sure I didn’t miss the one bus a day) and so after a quick walk around town for some lunch and a beer, was on my way again. 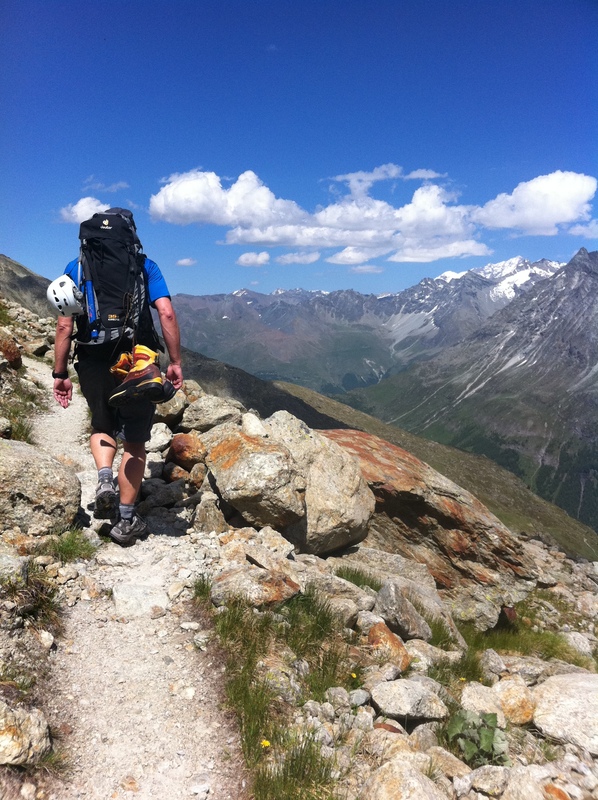 The journey up to Arolla is incredible. As twisty and as precipitous as any mountain road I have ever been on. It took about an hour and a quarter from Sion, going from around 500m to 2,005 m in elevation. The temperature also dropped incredibly. 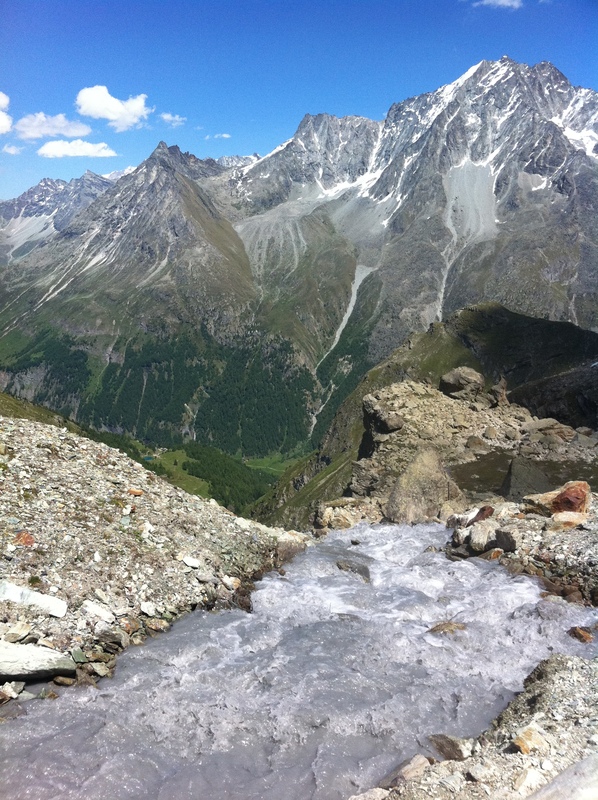 In Sion it was a 27C, in Arolla just 6C. 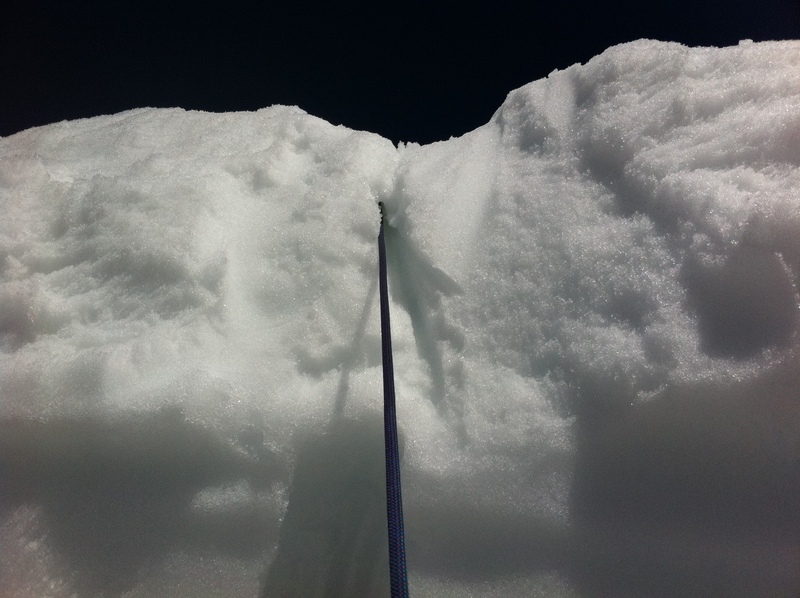 There was a stop half way in a place called Evolene, where the snows became apparent higher up. I expected to be sharing the ride with other people on the course, but there was just me and a young Australian couple making their second trip to Arolla. There are probably 60/70 rooms in the hotel, and it probably was a good hotel ‘back in the day’ – trouble is that back in the day was probably the 1880s. I need to look up in fact when the hotel was built, as I am sure it must hark back to the early days of alpinism. The weird thing after I arrive is that I am clearly the only person in the hotel, apart from the lady at the reception and her dog, which just happens to be bigger than me, although on the face of it is very placid with it. We have been told that we will be sharing rooms, and so a big influx of people must be expected from somewhere? The rooms are clean, and for what we will be doing this week, absolutely fine. It starts to grow on me in fact. Room 32 at the Mont Collon, my home for the next week. Eventually 7pm comes around, the scheduled meeting time to have dinner and meet up with Jagged Globe staff. I go to the bar/restaurant and am the only person there. Like really the only person – no staff, no nothing. Having read some reviews online before I arrived out here about this place being like The Outlook Hotel from the Shining, I am thinking there is something wrong. All I need is for two girls on tricycles to come squeaking down the corridor and say ‘red rum’, and I would have run out of the door faster than Usain Bolt and never looked back. Eventually a guy comes down the stairs (and he doesn’t look like Jack Nicholson, and so I breathe a sigh of relief), and says he is Andy from Jagged Globe. A really great guy, from The Lake District, a career climber. We are then joined by Andreas, originally from Germany, now living in Brussels, and then ultimately by Tim, a student at Southampton University who is from Bournemouth. Oh yes, and some staff 🙂 We were supposed to have been four people on the course, but the fourth member, Kelly, does not arrive, and we don’t know why. Oh and it turns out that Andy has done Island Peak before! He says he will do some fixed line stuff with me this week, so bringing my ascender stuff with me is not in vain. Dinner is actually great, four courses, and very filling. We eat rabbit, and it is very tasty. We are however the only people in the hotel, three people for seventy rooms. Such a shame, it really is. Andy takes us through a bit of what we an expect for the week. 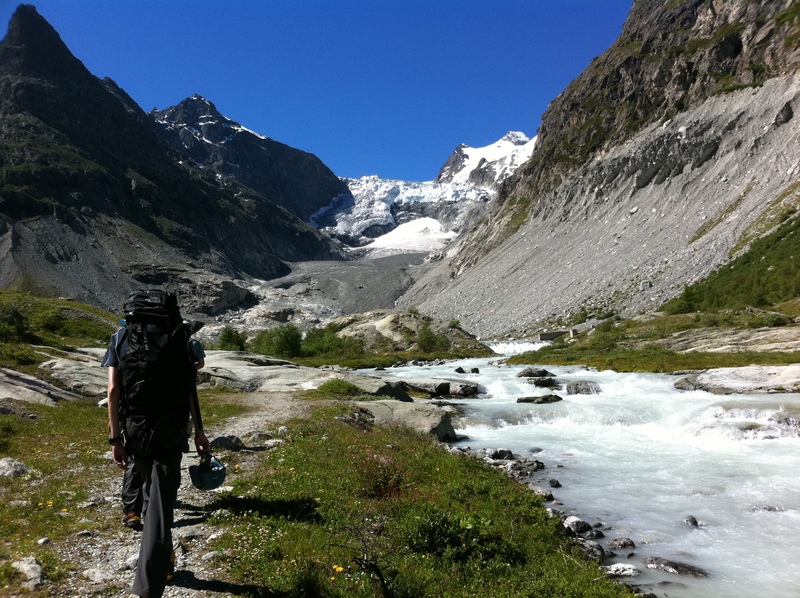 Tomorrow we will be on the glacier, and doing crampon and ice axe stuff. Sounds good, and I can’t wait to get out there. We start at 8. 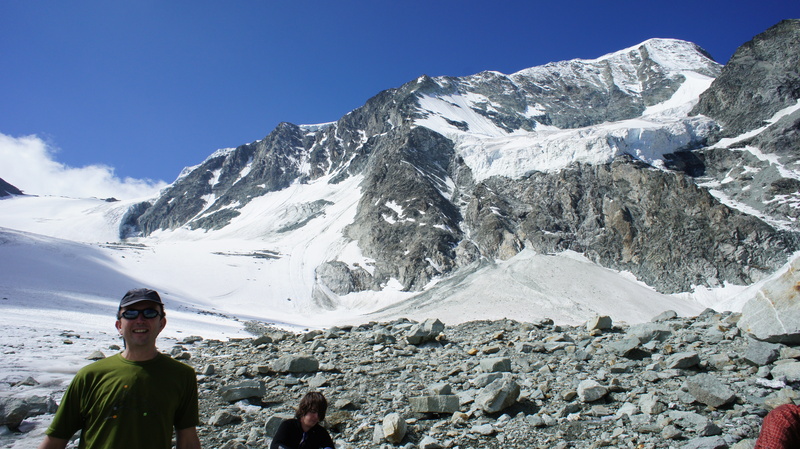 The snowfields/glacier on the Pigne D'Arolla. The hotel I am staying in on the other hand, looks like it needs a bit of updating, to say the least. A few reviews of it I have read online have used descriptions like ‘comedic’, and ‘like that place in The Shining’. Comedic I can cope with, I believe, but I don’t need Jack Nicholson pouncing on me with an axe in the middle of the night! The journey looks quite eventful too. The trip does not include travel, so it is ‘make your own way there’. After a flight to Geneva I have to catch a train to Sion, and then I believe two different buses to get me up to the resort. It should take about 4 to 5 hours all in. Should be interesting, but I am sure with typical Swiss efficiency it will all be pretty smooth. I look forward to the trip – it all adds greatly to the adventure. I am finally nearly ready with all of my kit, I think. Over the last week I have had a bit of a splurge, and bought myself a new climbing rucksack (Deuter Guide 35+), a new Primaloft climbing jacket (Rab Generator Alpine), a new Mountain Equipment holdall, and various other bits and pieces like gaiters, glacier glasses, Sigg Bottles (they don’t recommend Camelbacks), a buff (!) and several pairs of climbing gloves. I have also packed my fixed rope system that I bought for Island Peak, in the hope that I will get some help and tuition with it too, although fixed lines are not part of the teaching for the week. I will be amazed if I get below the weight limit of 23kg for the plane, so there may well not be many ‘normal’ clothes coming with me! Some of the kit that I will hire over there includes helmet, ice axe, plastic boots, belay equipment and ropes, and also crampons. 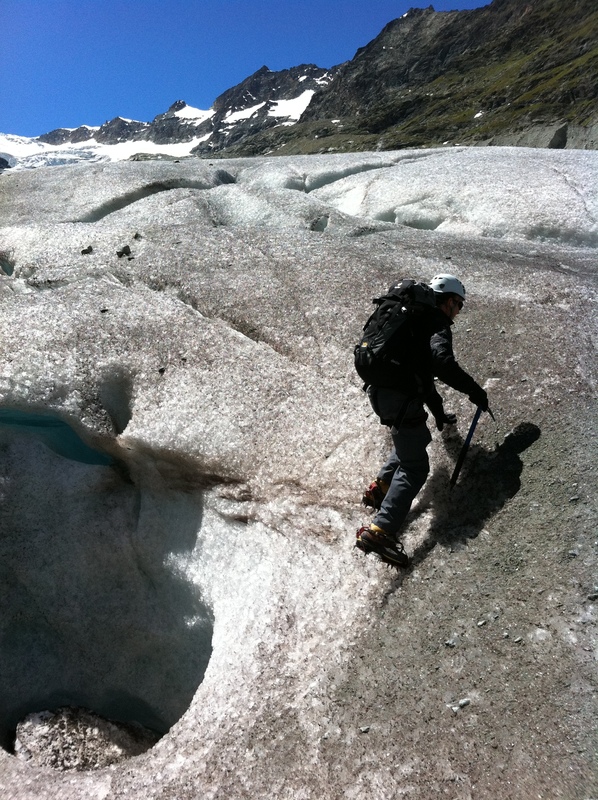 I look forward to the glacier travel and also crevasse rescue parts of the course in particular. Crevasse rescue looks terrifying! I’ll do one more post on Friday before I go with some pictures of all my kit. It all feels like this is the start of a new part of my journey, and almost of my life. If next week is successful for me, then not only does it springboard me into being able to climb Island Peak in October (and of course if it doesn’t go well then I won’t be climbing it at all), but also towards climbing more mountains. My ultimate goal from here is as many of the Seven Summits as I can – it may take some time, and it will certainly take a hell of a lot of resolve, effort and money, but I am very determined. I don’t want anything to get in my way, and certainly not Jack Nicholson!